Do you like extreme roller coasters? Well, get ready for something unique; a zero gravity roller coaster that would provide you with a brief zero gravity experience. BRC Imagination Arts took its cue from the NASA's 'vomit comet', a plane that uses a special looping flight path to provide zero G training for astronauts. BRC’s proposed theme-park ride would travel a somewhat simpler trajectory—up and then back down a soaring steel edifice, similar to the existing “Superman: Escape from Krypton” coaster at Six Flags Magic Mountain in California. But unlike Superman and other open-car coasters, the vomit-comet ride would be fully enclosed. Rather than the thrill of hurtling forward to one’s perceived doom, riders would enjoy the illusion of floating within a stable chamber. 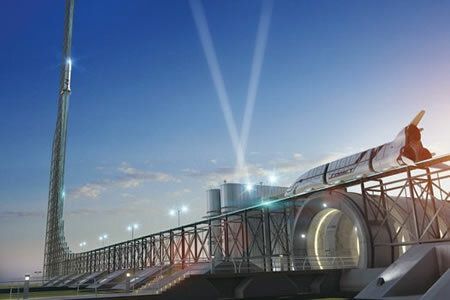 To create that illusion, a linear induction motor system would speed coasters up the track with unprecedented precision. As the coaster approached a top speed of more than 100 mph, it would suddenly and ever so slightly decelerate—just enough to throw the passengers up from their seats, like stones from a catapult—and then quickly adjust its speed to fly in formation with and around the passengers. (The ride’s calculations would correspond to the unique heft of any particular group.) As the coaster reached the top of the track and began to drop back down, the computer system would continue to match its speed to that of the falling passengers, extending the sensation of weightlessness for several additional seconds, and finally rapidly decelerate to a stop back at the base station. All BRC needs is a check for $50M and they'll build one and have it ready to go next year. Kickstarter funding, anyone? Snakelike and faroff around the edge of the Park the Gravity Whip coiled, offering a total of thirty seconds of weightlessness via computer-designed parabolic arcs. Via PopSci; thanks to Erik Glenn for providing the story tip and reference.